health | Web 2.Oh. . .really? Not one more pixel need be spilt about the issues of privacy, security, HIPAA, metastatic data, third-party crashers, or corporate imperial overreach raised by the debut of Google Health. Let’s just snap on the latex gloves and do a quick exam. This won’t hurt a bit. You can enter your “conditions” either by entering text or choosing from a disheartening alphabetic menu of bodily afflictions, from Aarskog Syndrome to Zollinger-Ellison Syndrome. The list is 20 screens by 3 columns deep when spread out on one endless page. Immediately preceding the last entry is “Zits”–a nice bit of diction that helps reach users where they live, so to speak, to humanize the Google Machine. As with many conditions that populate the picklist (no pun), there’s a pre-loaded search for zits. But only certain conditions are pre-loaded with searches. Although “whiteheads” was on the list, when I typed it in there was no stored search. When I did the search myself up popped the zits search results. To give the product a test run as you can see below I chose a number of conditions from the list — WHICH, IF YOU ARE AN INSURER, EMPLOYER OR ACQUAINTANCE, I ASSURE YOU ARE ENTIRELY MADE UP AND DON’T APPLY TO ME AT ALL, IN FACT I AM PERFECTLY HEALTHY. I also tried to throw Brother Google a curve ball by describing the same conditions using several different terms, i.e., arthritis, osteoarthritis and bad knees. I was permitted to add these as I wished. To see if there was any filtering or databasing of my conditions going on, I outright invented a disease by lashing together some of my favorite Greek roots: pyohemoflatalgia. (Go ahead, look ’em up.) Brother Google didn’t blink. Conclusion: Google isn’t databasing my conditions. I’m just entering text, and the alpha picklist is just there to prompt people to identify diseases by common names. Hit the “research” link accompanying any condition and up pops a neatly tailored page on the topic. Most of the page (on, say, osteoarthritis) consists of a spectacularly workmanlike article from the utterly competent information provider A.D.A.M. The right rail has a set of links curated by some unknown hand or machine. Depending on the topic you may get a few blurbs of news items (by some method culled from the longer, messier, far less coherent Google News results on the same topic), links to Google Groups, Google Scholar articles or related searches (“search trends”). Observation: The regular–i.e., non-Google Health–Google searches on the same topics provide better results than Google searches on non-medical topics. (Google has for some time used a service called “Google Co-op” to serve up results from only selected health content providers.) This is good–a tacit acknowledgment by Brother Google that searches for lymphoma are more important than those for, say, “David winner Idol”. 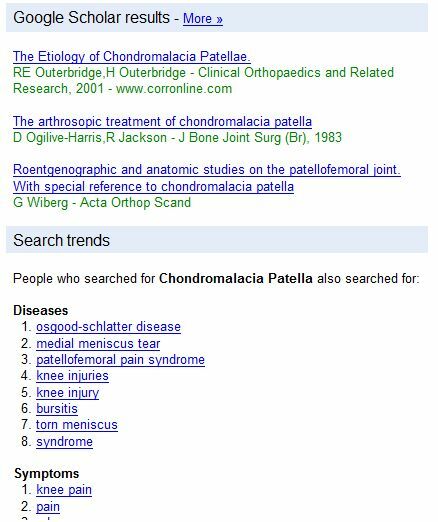 STILL, THE FIRST LISTING ON THE TOP OF GOOGLE SEARCH RESULTS FOR MANY HEALTH-RELATED “SEARCH TREND” TOPICS IS OFTEN FROM WIKIPEDIA. WOULD YOU GUYS STOP THAT? We all know how Google overuses the term “beta” to (correctly, often) imply an evolving product and to (necessarily, often) seek forgiveness for bugs that haven’t been scrubbed out yet. Well: After creating “my” “personal” health “record,” I tried the Google Health (beta) find-a-doctor function. 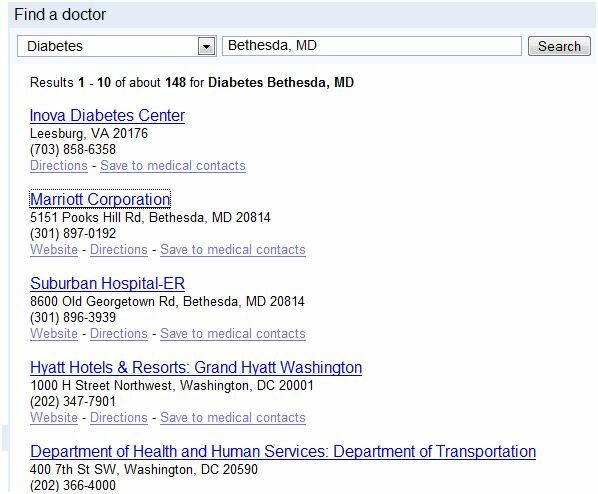 “diabetes” doctors in “Bethesda, Maryland.” Enter. This keystroke should have triggered a klaxon audio file that screamed BETABETABETA!!! Ah-OOO-Ga! Ah-OOO-Ga! I don’t know, maybe that top endocrinologist is staying at the Grand Hyatt Washington. Or maybe he’s taken a job with the Department of Health and Human Services? (Or is it the Department of Transportation?) Who can tell? Anyhow, the seven minutes I have for basic clinical exams is over. It was fun giving Google Health a quick once-over. But it’s a good thing the medical record is a fake. I don’t think it’s ready for circulation yet. In fact, there were enough suspicious observations in my quick exam that. . .I think I may have to schedule a biopsy next. Who knows what’ll turn up? When I committed the sin of self-promotion by writing about the HealthCentral Healthcare08 PoliGraph, in which I had a hand, I really had no idea I’d need to come back to the topic. But the project, which plots the presidential condenders’ healthcare views on a snazzy interactive graph, has generated a bit of controversy in electroland. I’ve responded on the HealthCareBlog site (to which I have recently been invited to contribute), where most of the comments have collected. See also a very thoughtful (if deeply critical) analysis at Ezra Klein’s excellent American Prospect blog. Where are the candidates’ heads on healthcare? I just completed work on a campaign dataviz (data visualization) project for Health Central network, called the Healthcare08 PoliGraph. It plots the presidential candidates’ positions on six health care issue on both left/right and most important/least important axes. The whole point of the project is to use interactive technology to help people extract themselves from the candidates’ rhetorical mush and actually see their differences in policy positions on issues like stem cell research and drug price controls. I leave it to others to determine how successful the application is at accomplishing this goal (to say nothing of how accurately we’ve mapped the candidates’ positions. I suspect the campaigns will weigh in on that). The application lets you see, pretty easily, when GOPers drift into Democrat territory on certain issues (Rudy Giuliani on stem cells, John McCain on drug prices). Oddly, no Dems, except for the, how you say, difficult-to-pin-down Mike Gravel, drift into the Red Zone. I love the way the candidates’ heads reorganize themselves when you click from issue to issue. And the way they get bigger with mouseover. Our Flash guy deserves a case of Stoli and a case of Red Bull, ideally to be enjoyed simultaneously. Any comments, especially constructive criticisms, warmly welcomed. Meantime, thank you for indulging my self-promotion. We will return to our regularly scheduled harsh critique of others’ work tomorrow. Ann Romney, wife of Republican presidential hopeful Mitt Romney, has launched the first wife-of-a-candidate website. Along with the usual it’s-exhausting-but-I-love it pieties, she writes about her battle with Multiple Sclerosis. When I was first diagnosed, it was probably the most difficult time for me. I was having difficulty with my physical balance, but I would soon realize I was having just as much difficulty with my emotional balance. I was overwhelmed and had so many questions. I had always been an independent person, strong and able. I saw the disease as an invading pac man – eating away at the myelin that was protecting my nerves. It was chewing me up, but I didn’t know when or how it would spit me out. But then she writes about her treatments, some of which are quite unusual. Reflexology, for instance, is a highly unorthodox manipulation of the soles of the feet, based on the theory that various parts of the foot are related to organs and bodily systems–the tips of the first three toes correspond to the brain, for example. And then there is equine therapy, a more widely accepted form of exercise in MS treatment. Equine therapy has been particularly successful for me. The rhythm of a horse’s gait closely assimilates a human’s and moves the rider’s body in a fashion that enhances muscle strength, balance and flexibility. The connection both physical and emotional among horse and human is powerful beyond explanation. She continues to say how lucky she is to have had access to access to top-tier care–and that she believes making affordable, quality care available to all is an important priority for both Mitt and her. But how does this square with her husband’s stance on applying “conservative principles to health care?” Detailed on his site is his 10-point plan to spread health insurance to all Americans, the usual conservative checklist of reducing regulation, providing tax breaks to corporations, unleashing the power of the free market and leashing trail lawyers. Interesting. Of course, Ann has had someone else pay for her care–she has presumably been covered by insurance paid for in part by the good people of Massachusetts. And whether Mitt Romney’s proposal to unyoke the health care system from the weight of the federal government will result in private insurance that pays for reflexology treatments and equine therapy for the nation’s most needy citizens with MS is a question he has not been asked. You have to wonder whether encouraging Ann to post her MS story on her spousal website was such a good idea after all. Google Health: Your Interest or Self-Interest? Like its fellow Brobdingnagian competitor Microsoft, Google has plans to enter the world of personal health in–no surprise here–a big way. Both firms plan to offer medical records, improved health search and other features designed to profitably entangle health consumers in the management of their personal health care. They’ll join the long-established pack leader WebMD, the deep-pocketed Revolution Health* and at least half a dozen other legit contenders for some market share of health consumers. There are screen shots floating around of alpha versions of Google’s personal health record tools. You can preview a beta of Microsoft’s new health search on the Health and Fitness channel on msn.com. But I was playing around with Google’s new health search the other day and was struck by a wave of nausea. Put “depression” in the Search Engine of First Resort and you’ll see (firstly) a couple of Adwords purchases stripped across the top of the results, then a second horizontal strip of links, which are choices by which you can filter your search further (i.e., Treatment, From Medical Authorities, Alternative Medicine). All of the following results are said to come from what are called Google co-op partners, described as trusted sources of health information. This appears to be true. But if you do not click on one of those filters, you get Google’s organic results. And the first result when I put “depression” in the search engine was depression.com, a site devoted to the deadly disease sponsored by. . . GlaxoSmithKline, maker of the depression drug Wellbutrin. Depression.com describes the disease and lists treatments that include talk therapy and, of course, medication. The only medication the site acknowledges is Wellbutrin. Not Prozac. Not Paxil, not Zoloft or any of the newer drugs. It mentions electroconvulsive therapy, for god’s sake, but not Prozac. This creates a potentially terribly misleading scenario. A user–aware that Google has a new health-related search method that filters out the heavily SEO’d, popularity-based claptraps that a Google search often produces–in good faith does a search on a disease name and gets results topped by one of the heavily SEO’d, popularity-based claptraps the new search is supposed to filter out. To be fair, that top listing for depression.com is not purchased by GSK. They earned their top listing the old fashioned way, which is to say buying the best keyword url and then SEOing the hell out of the site. Google may defend the practice of holding back its list of filtered, trusted sites until a user clicks to narrow the search. But assuming at some point Google will promote its “health information from trusted partners” search results when it debuts its full health service next year, I believe it’s a misleading practice that should be changed by launch. It also raises the big question posed by Google’s entry into the personal health space: Will users be able to trust a company whose economic engine is fueled by delivering economically self-interested advertising to users–and whose practice is to deliver popularity-based, SEO’d results in response to searches–to provide disinterested information on personal health? I don’t know the answer to that. But so far, the Mountain View collossus seems to be in danger of putting misleading information in front of some very vulnerable consumers who are looking for a credible source of information on a very serious matter. It’s too early to call that sick. But not to consider it an early warning sign worth monitoring. With all the talk lately about Microsoft’s search plays–the shrewdly coercive debut of its Windows Live Search service, and its Ask.com partnership/talent raid–a new feature in MS’s search portfolio has quietly surfaced in beta form. It looks good. In February our friends in Redmond purchased Medstory, a search engine serving the health vertical. [This is all part of the company’s plan to enter the enterprise and consumer health spaces in a big way, summarized nicely in this blog entry by ZDnet’s Mary Jo Foley.] The first public display of MS’s deployment of this technology now appears on MSN’s Health and Fitness pages. Quick tour: From the Health and Fitness home, search for your favorite condition, treatment or disease (scoliosis, let’s say). At the top of the results you’ll find something called a “dashboard,” a graphical arrangement of results within key subtopics (“Diseases and Conditions,” “Tests and Procedures” and so forth). Each item in that category is represented by a bargraph-style bar indicating its relevance (“spinal fusion” tops the “Tests and Procedures” subtopic, for instance). The dashboard graphic is powerful, probably the most-instantly “gettable” method of arranging results I’ve seen, certainly in the health space and (I think) anywhere in searchland. The popup triggered when you choose a 3rd-level result (spinal fusion, in the example above) is annoying as hell, since it makes you choose between “scoliosis and spinal fusion” or just “spinal fusion.” If I were taking this out of beta, I’d eliminate the popup and drive the user right to results for “sciolosis and spinal fusion,” putting “search spinal fusion alone” as an option above the results. Graphically, the closest competitor in the health space is Healthline, a well-machined engine that presents results in a wicked-cool “HealthMap,” which presents results via a kind of knowledge tree. Then there’s WebMD’s weak-pulsed search, a product of the wayback machine with some search-narrowing tool add-ons. Unless the 650-pound gorilla in the health consumer space has something extraordinary in development, they may find themselves in trouble. With vertical search all the rage among the geekocracy and VCs alike, the MSN/Medstory tool is worth a look. At this point, though, I’d still use Google to find stuff on scoliosis. But our friends in Redmond are used to playing catch-up. Sometimes they succeed, even in a truly competetive space.